By day, Monica Holy's life looks like millions of others. She paints, jogs, talks to friends, and worries about her children. Monica's nightlife is a different story. Since birth, she has entered extraordinary worlds of consciousness through the portal of lucid dreams. While there, she conducts souls to the other side and to the light and teaches, guides, and heals. She enters these non-ordinary realities not just to explore them, but to work on behalf of the human community. In Fringe Dweller on the Night Shift, she eloquently recounts her psychic and spiritual work with the troubled dead, the newly dead, or those about to die -- especially children -- to provide emergency relief. She also brings back messages from the world beyond this one, by offering each and every one of us inspiration and ideas for honoring our feelings and connecting to the divine expression of all that is. Ultimately, we will all see The Grid (chapter 10): the invisible reality beyond our five senses that underlies all physical form as we know it. 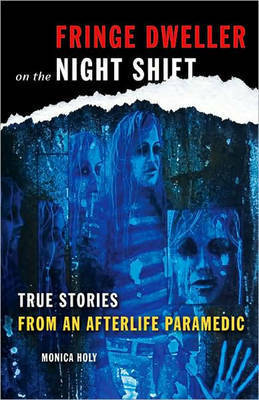 Fringe Dweller on the Night Shift combines cosmic adventure with down-to-earth practical information -- part art, part memoir, part philosophy, part guidance, this book is a work of the heart. Monica Holy's work is in the spirit and tradition of native, shamanistic travelers (a la Don Juan in Castaneda), spiritual mediums ( a la John Edward and James Van Praagh), spiritual guidance from other realms (a la Shirley MacLaine), and what the Akashic realm looks and feels like (a la Deepak Chopra). Monica Holy is an artist, psychic medium, spirit guide, and mother of two. She has worked in animation, photography, and typography for film and television. For most of her life, she has kept her psychic and spiritual life a secret. She feels the time is right to share her story in hopes that it will help others understand their own journey through life. This is her first book.